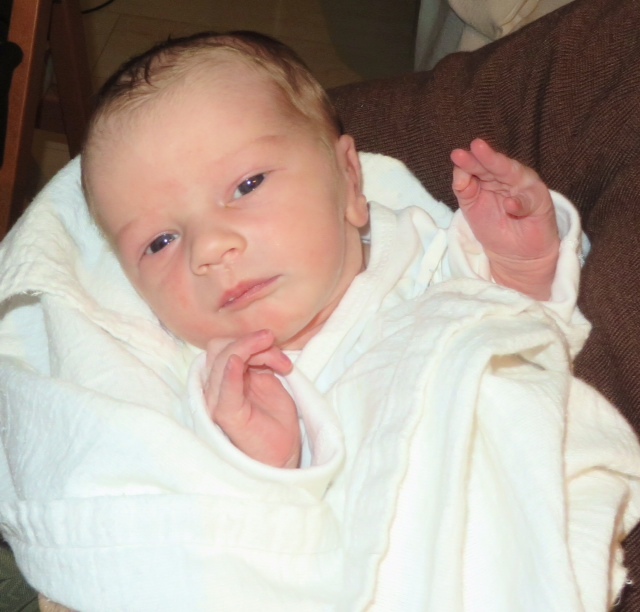 On Tuesday I drove slid to Royal Oak Beaumont hospital to meet my new little nephew Joseph Palte. He is even more handsome in person than pictures can portray. He looks just like his daddy with a hint of my beautiful sister mixed in as well. I think his hands move just like hers do. And to see my sweet little sister lying on the hospital bed exhausted and vulnerable, but stronger than she could ever know; so raw to new emotions and feelings that a mother can’t get her mind around after the birth of her first child, reminded me of just how terrifying and surreal it all is. You can read every book about becoming a parent that has ever been written. You can try to imagine that moment a million times in your mind. You can hold dozens of newborns and think you will have some understanding of how you will feel when you become a mother, but you have no idea how your story will go until that day arrives. My sister began her journey very humbly. She has said all along that she knew it would be difficult and knew her life would change even acknowledging that she didn’t know to what degree. She allowed me to flex my “older-sister-muscles” and state my opinions on what sort of stroller or car seat I would get and even let me come along when she and Eric went to register at Babies R Us. She has been so open-minded and courageous in spite of morning-sickness through half of her pregnancy, her O.B. quitting his practice when she was very far along and then beginning to see my O.B. instead. She rolled with every punch thrown at her. I kept feeling the whole time like she was even more qualified at this mothering-business before she became one than I have become in five years of actually being a mother. When I held her son in my arms on Tuesday night, and as his daddy told me the story of Joey’s birth, I couldn’t help but feel a new-found camaraderie with my sister. I glanced up at her occasionally when I could pull my gaze away from her perfect little boy and her eyes were brimming with tears, her lip quivered holding back her emotions, because I think on some level she probably couldn’t believe all she had been through in the past twenty-four hours had really happened. She now has her own birth story of her own child. It’s nothing from a book. It’s not another mother’s story. It’s hers. She can tell about how Joey decided to come into the world in the middle of a Polar Vortex, when the temperature plummeted lower than it has in decades. The roads were more like driving on a glacier. Maybe Joseph is already an adventurer at heart! But these will be Cathy’s details to share. I am so proud of her. She probably hasn’t processed all of the emotions because sometimes in those first few days you can even forget you have to breathe. But when you get really lost and overwhelmed, Cathy, just remember that’s all you have to do. I love you! Congratulations to you and Eric. God blessed me with my beautiful daughters. I ‘m so grateful. thank you, cousin! love you too! Congratulations on the birth of your beautiful son. Warn wishes and blessings to all of your family.